My crazy, fun friend, Kathy, shared this recipe with me. Kathy is Celiac and often cooks "gluten-free". My family enjoys different salads in the summer... so I decided to try Kathy's yummy salad. We loved it! Kathy told me to double the recipe and to cook my quinoa in a rice cooker. I don't have a rice cooker. I bought my quinoa at Costco and just followed the directions on the package. I have a good-size bag of quinoa so I am going to have to come up with some new quinoa recipes. I thought it tasted yummy right out of the pot - reminds me a little of brown rice. I pretty much followed Kathy's recipe to a T! My middle daughter was with me when I made it and she thought I should add avocado to it upon serving. I didn't put avocado in the whole recipe - just in individual servings. I also think you could add grilled chicken for a complete dinner! Try this yummy, refreshing summer salad! Cook quinoa according to package directions and allow to cool. While it is cooking, make dressing and prepare ingredients. 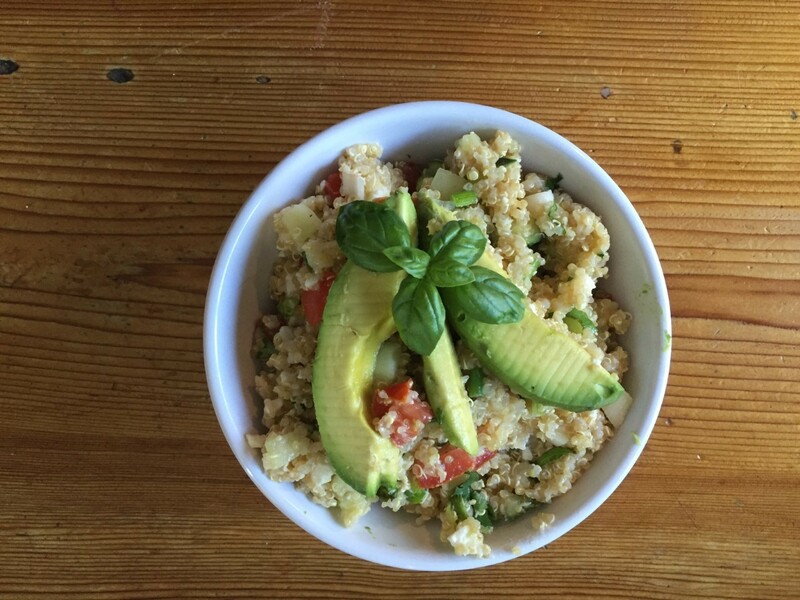 Once quinoa is cooked and fairly cool, add all ingredients to the quinoa. Add the dressing! Toss and chill until ready to serve.